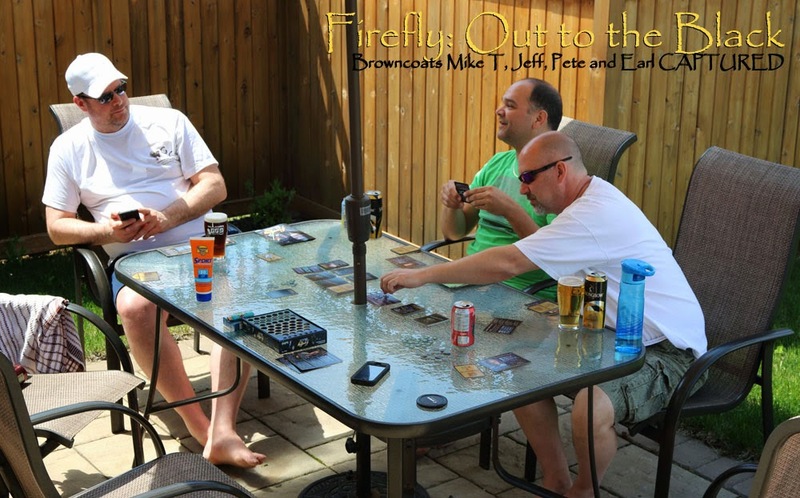 For day two of our G&G adventure in May, Jeff brought along a simple but challenging card game, Firefly: Out to the Black. 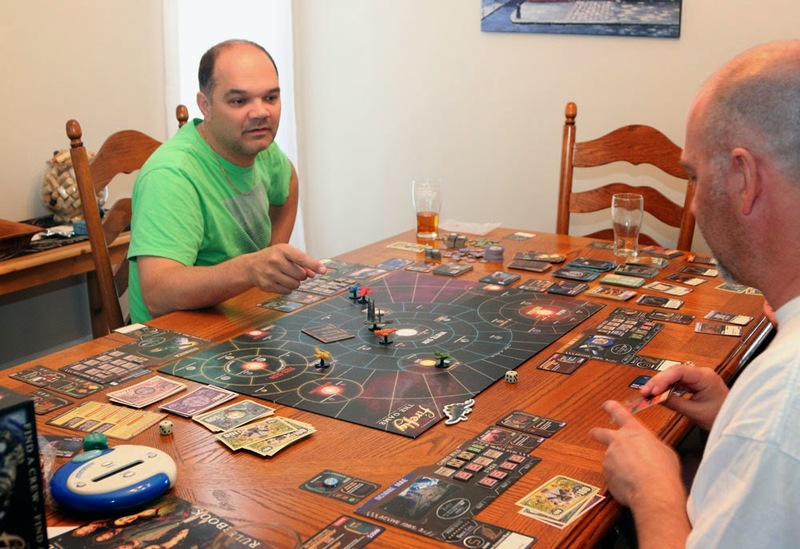 This cooperative adventure pits the players, taking on the roles of the characters seen in SF cult favourite Firefly, against their nemesis, the Alliance. 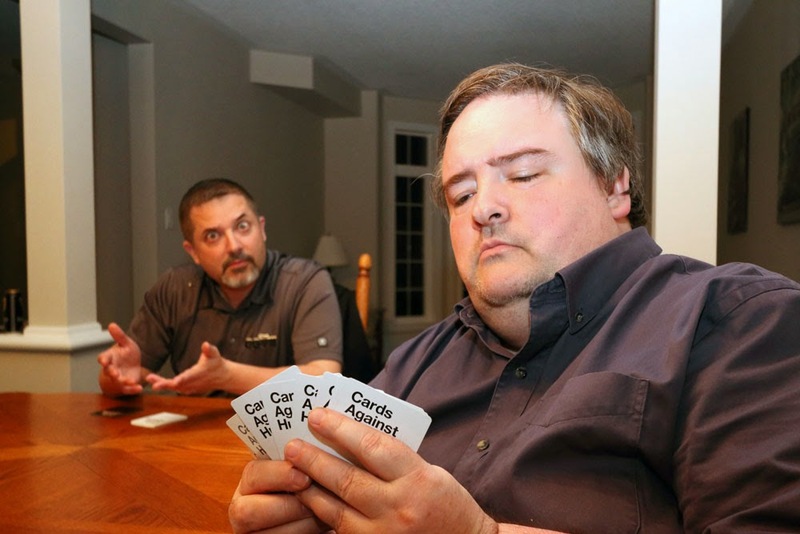 Jeff, Mike, Pete and I sought out Jobs (mostly illegal) and did our best to avoid the Alliance, but eventually they caught up to us and now our shenanigans will have to be confined to an Alliance re-edumacatin' centre. Life's rough in the black! 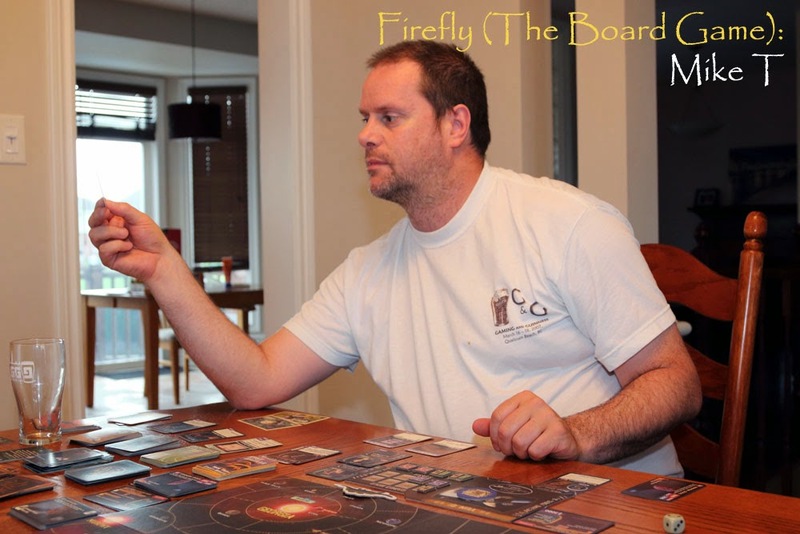 We fared better in another Firefly game, this one a gift to Rob for his birthday. In a heated competition, Mike's motley crew emerged victorious, though I was behind by only one turn. 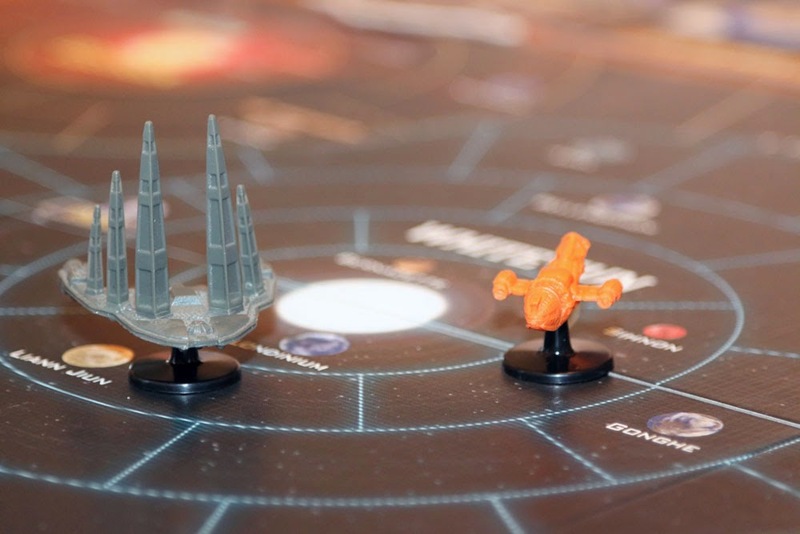 Unlike Out to the Black, in which each player takes on the role of a character from the show, Firefly: The Game is a competitive battle and each player leads his or her own ship into the deeps of space. It's a handsomely designed game, with quality pieces. It takes a while to set up, but once you get the hang of it the game runs smoothly. 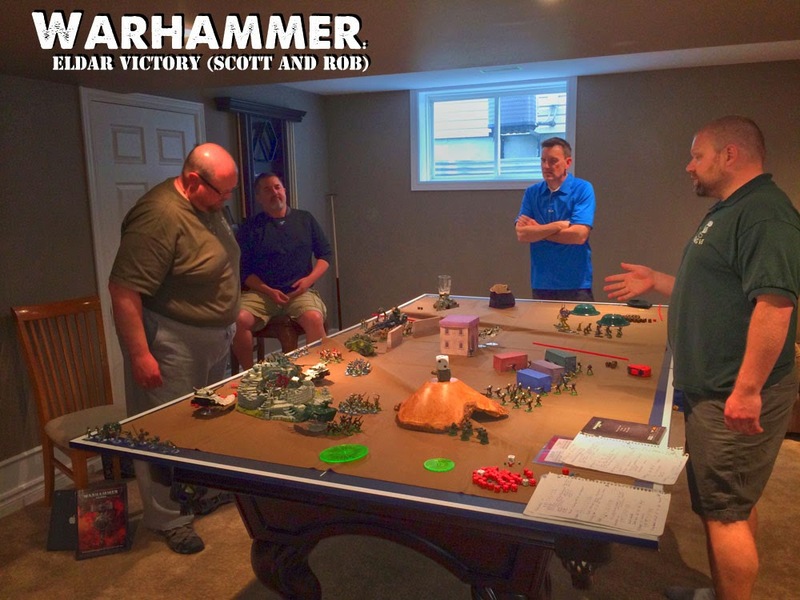 Meanwhile, Rob, Scott, Island Mike and Steve were downstairs preparing for their annual Warhammer skirmish. 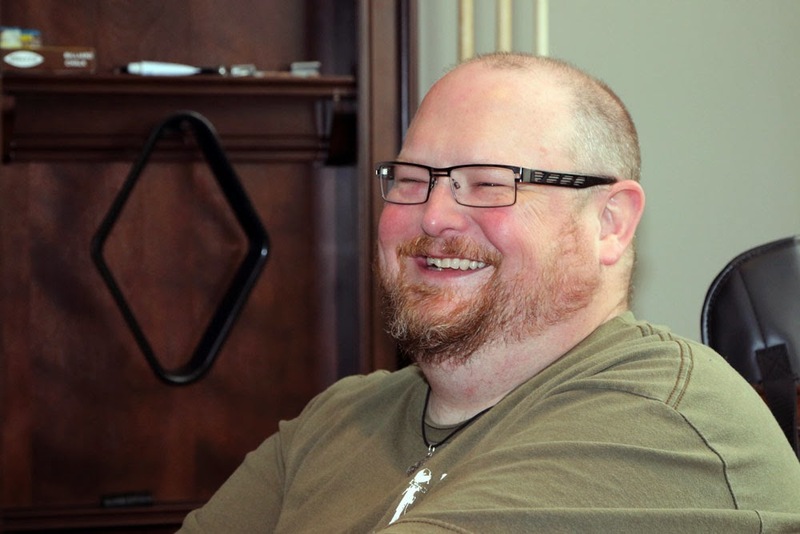 Rob's models were being used for the first time in years - another reason we gathered in Ottawa. 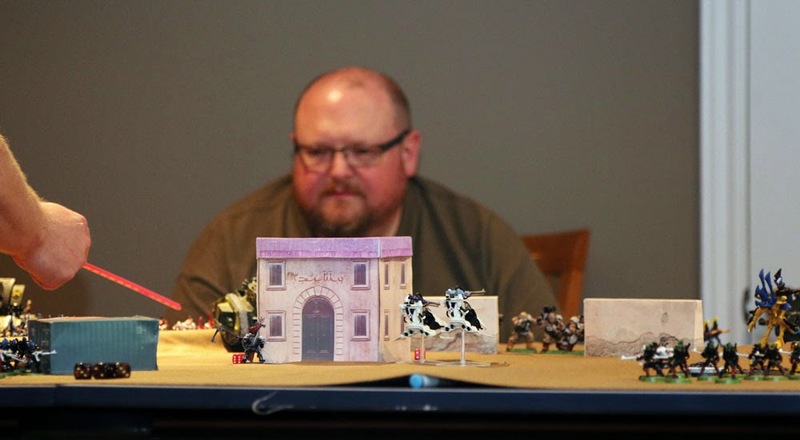 It would have been too hard to lug all of Scott and Steve's scenery across the country, so they made do with papercraft obstacles, plus some of Rob's home decor. 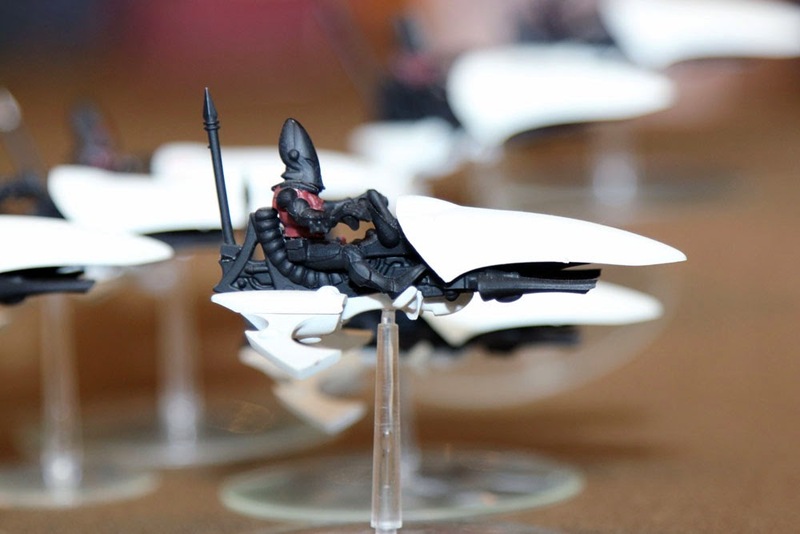 I continue to be amazed by the superb paint jobs on these models. 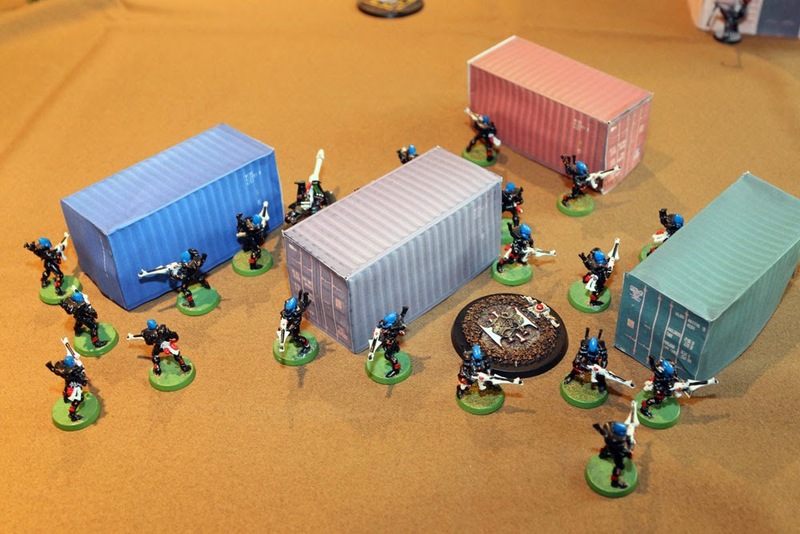 I was particularly charmed by these papercraft shipping containers. 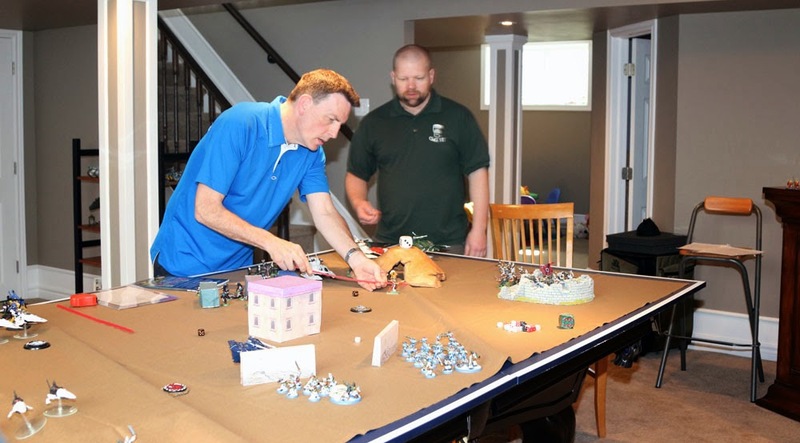 Warhammer usually takes the guys about four hours to play. It's a complex game with dozens (hundreds?) of individual pieces. Here, Island Mike carefully considers where to place one of his tanks. 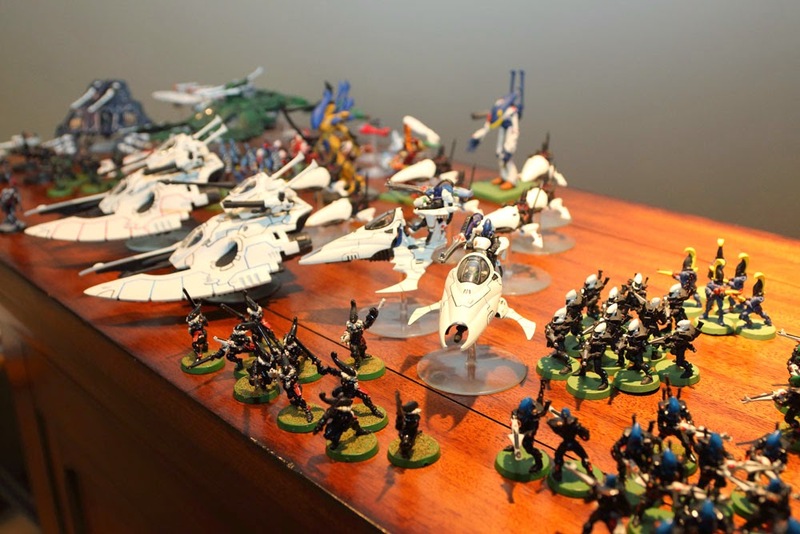 In the end, it was a victory for the Eldar. 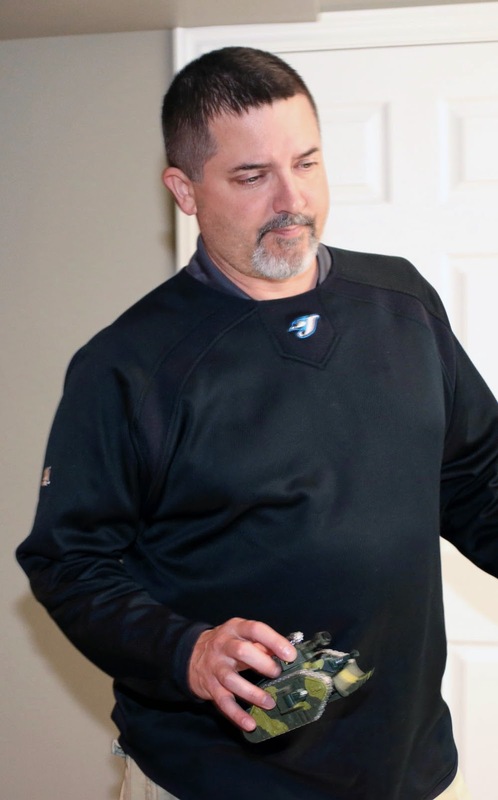 Perhaps playing on home turf helped Rob's side. Where there is gaming, there must be Guinness. These are called "car bombs," if I remember correctly. 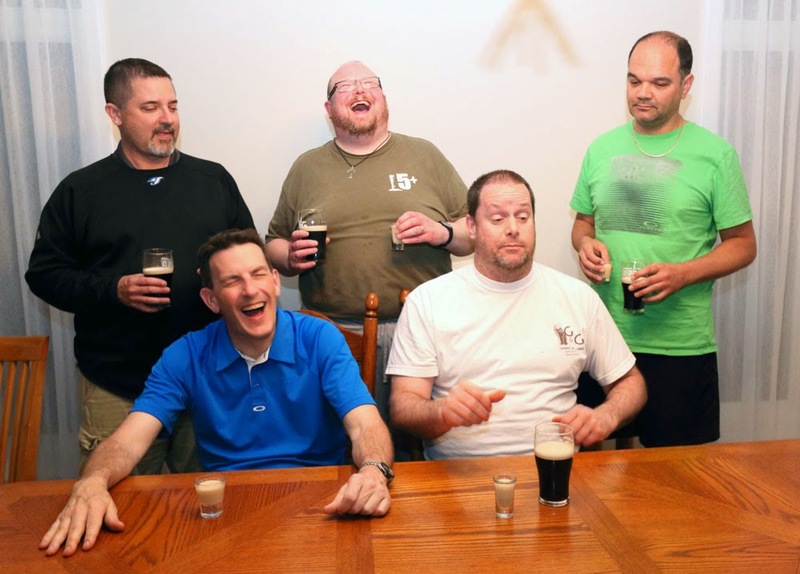 Labels: Board Games, Games, Gaming and Guinness, Jeff P., Mike P, Mike T, Ontario, Ottawa, Pete, Rob D, Scott F., Stephen F.
I dearly wish I could remember what made Rob and I laugh so hard in the car bomb picture, but Totty's face makes me think he is at least partially responsible.